This special award is coveted by all. 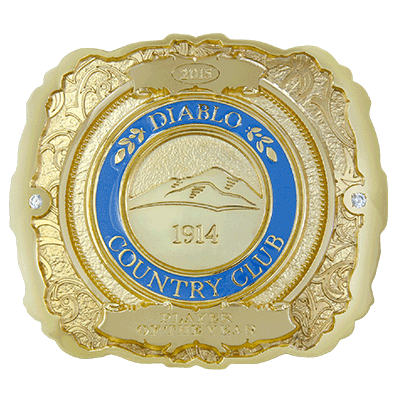 The Diablo Country Club "Player of the Year" Giant Buckle award is a 1-piece sculptural gold plated 5" x 5" belt buckle with blue epoxy and 2 round 5mm clear CZ's. This distinctive award has become a tradition with a new one made and engraved annually for the best golfer at Diablo Country Club.